Winter make that Spring! on the Yellow Dog Plains. 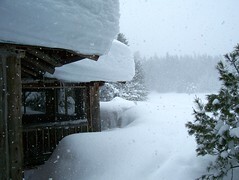 Deep, deep snow still covers the plains in mid-March, Vernal Equinox — far more snow than elsewhere in Marquette. 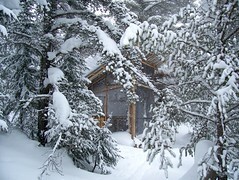 I skied in with a friend, and we enjoyed several beautiful days in the snug Winter Cabin. 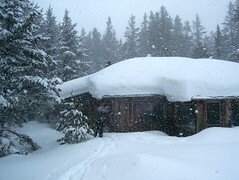 During this time, it continued to snow on the plains. All my woodpiles were buried! Triple A was drifted shut west of the Salmon Trout. 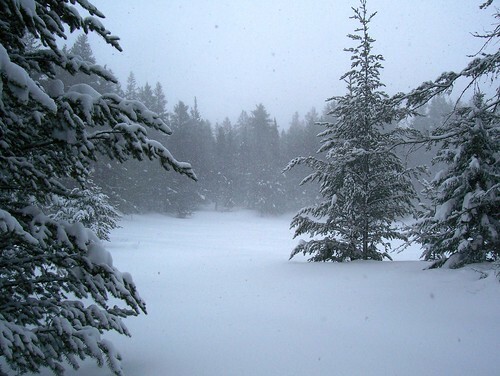 Above: West Bentley Pond in deep snow, March 2013. 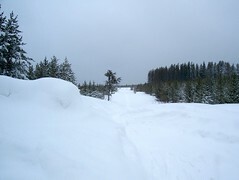 Above: Two views of the Winter Cabin, view of the Gleaning, and view of the Triple A road, buried in snow.